The real beauty of this card is not my artwork, it is the paper I stamped it on. This paper loves ink, It allows it to move freely in the swirls – you never know exactly how it will come out! Looks like beautiful vintage plasterwork with high-intensity shimmer! For coloring, I used only 3 alcohol markers. Instead of using a blender pen, I use 91% rubbing alcohol and a brush! No more stain transferring from one color to another! Add a bit of ribbon, distress glitter and a sentiment and my card was done in 15 minutes! My next post on 4/14 will show you how I made the second card using Eclipse Black paper… Stay tuned! 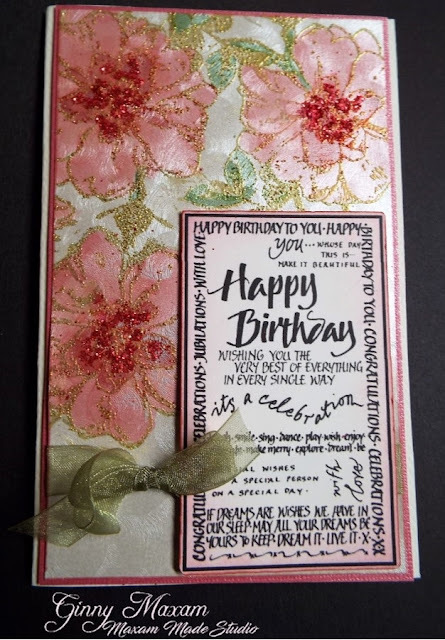 1 comment to One Stamp, Two styles, Part One, plus a freebie.